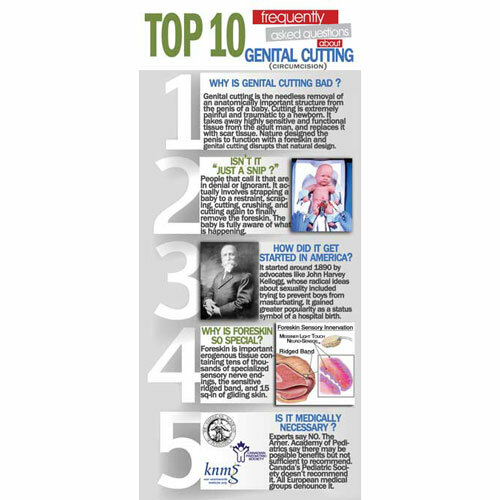 Use these cards to educate the public about genital cutting with 10 hard hitting facts. Double sided list of common questions asked by the public at our events with the Mobile Education Unit. Why is genital cutting bad? How did genital cutting get started in America? Why is foreskin so special? Is genital cutting medically necessary? Why would parents cut their son? Printed on 14pt High Gloss Card Stock. 4″ wide x 9″tall. Our info cards come in packs of 100. Intaction makes these available at our cost. Be sure to have some on hand at your next event.